8 Tips To Help You Get That Fantastic Lawn you always dreamed about! To get that perfect lawn that you always wanted it takes work, time, dedication, and some tips. There are so many things you can do to help get you the ideal landscape, but most of them can be very time consuming. 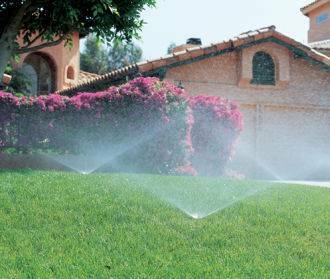 Getting a lawn sprinkler system will help tremendously by taking away all the time you would have used to water. But, there are still other steps that need to be done in order to get that dream lawn. American National Sprinkler and Lighting strives to help people achieve a beautiful green landscape that they have always wanted. Here, we provide some tips to help you achieve just that. This one is easier said than done since mowing your grass takes time, especially if you have a large area to do. Frequent cutting will help ensure that your grass grows in thick and doesn't allow for weed growth. Remember to keep your blades sharp so the lawn is cut crisply. You want to try and mow once a week. When you have mulch bits and clippings, go ahead and leave them in the grass; this will rid all the bagging trips, but also fertilize the soil. Mowing when it's wet means you walk on your wet grass and this can compact the vulnerable soil, which compacts the grass roots and kills the grass. This will result in a bald spots. As an outdoor sprinkler system company, we know how important it is to water your lawn. Make sure to water your lawn when it needs it, but do not over-water it. Over-watering your lawn encourages the roots to grow shallow and that's not good. How do you know when it's time to water? 1.) If you sense thick, dry soil it's time to water your grass. It helps to put a screwdriver into the lawn, and if the ground resists, it's time to water. 2.) The grass is slightly blue-ish. 3.) When you walk on the grass and your footprints remain compressed. This is a sign that your grass needs to be watered. 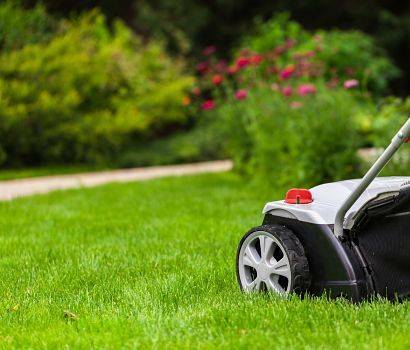 It can seem like a good idea to cut your grass real short so it looks nice; well, you want to cut it short or there is no point in cutting it but don't go too short! When you cut it real short, it requires more watering and it needs more herbicides to stay healthy and protected. Try not to cut it no more than a third off at a time. Your lawn needs time to dry or it will be vulnerable to disease. The best time to water is early morning as the sun is rising which lets the drying process start immediately after it is watered. It's fine to use fertilizer and pesticides but do not use too much, it's overkill. It will burn your lawn and is also bad for environment. Don't let your weeds get out of control, use proper weed killer on them and make sure to spot them before they become a real problem. If you feel like you need some extra fire power against those weeds, then you can get some herbicide. Make sure to choose the right stuff, you can get pre-emergent or post-emergent. The pre-emergents help prevent weeds from germinating and you apply them once a year or so. The post-emergents are when you have visible weeds that are already a problem. Most herbicides are synthetic but you can find natural methods. If you have any questions or comments, feel free to call American National Sprinkler & Lighting at (847) 566-0099. You can also follow us on Facebook and Instagram!